← Who’s Afraid of Halloween? Our Laundry Plan is just that: OUR Plan. It’s a group effort which requires all ambulatory people in the home to contribute. We will plop down and fold clothes while watching football, soccer, or In the Kitchen with David on QVC. (He’s a hoot! )My point about laundry is that it doesn’t have to be a monster. When ours gets backed up I remind myself I could be doing laundry in creek using lye soap instead of pushing a “start” button. The time spent sorting clothes can be used to pray for the teenager who wore this soccer jersey in a game that went to double overtime and a shoot-out that didn’t end in her favor. I found a print by a Polish painter of the Blessed Mother hanging laundry while baby Jesus played at her feet. It hangs in my laundry room and reminds me that joy can be found in doing the most mundane things. For whom we’re doing is the point, and why. That perspective makes the piles of laundry less daunting. Danielle: I love this! No perfectionism allowed is such an important rule to have when it comes to family logistics. Danielle: You had me at “more clothes,” Amy. Claire:I only have one child, so I’m sure my volume of laundry is much less than the majority of your readers. But my approach has always been to do at least one load each day, rather than letting it pile up. My family averages about 10 loads/week, meaning that I do 1-2 loads each day. I suspect that if I had a larger family, my approach would be the same. I would most likely do several loads per day, folding clothes that are prone to wrinkling sooner rather than later, or at least laying them out to prevent wrinkling, and then folding the rest when able. Possibly enlisting the help of husbands/children while watching TV in the evening. Danielle: I think it’s helpful to have the perspectives of moms from all different families, Claire, so thank you for sharing. And your approach is a good one for all of us — do it every day so that it doesn’t have a chance to get out of control. Saves your sanity for sure! Sarah: My mom and in-law’s live with us (and we have six kids) so 11 people and we do all the laundry. We do my in-law’s laundry once every two weeks, since they usually don’t have much, and have a specific day to do their one load. My mom’s is also done on a specific day, once a week (or as needed). The rest of us end up with a bunch of laundry bc we have kids, enough said, but we have one still in diapers and another still potty training, so hence piles of laundry. I try my best to not do house work on Sun’s and although Mon’s tend to be crazy I try my best to do our laundry every week on Mon’s bc we know our clothes for the week should be done and clean. Many weeks someone out of the kids won’t get their stuff put away. I try to incorporate the kids to help load the washer, move it to the dryer, or help fold. We take turns constantly which helps. Getting it put away is the difficult part (even for my husband, so sometimes I’m nice and do it for him). 🙂 We used to use Tide because it just smells so good but after learning about how many dangerous fillers are in there I started making my own, but that took a lot of time and didn’t smell as wonderful as our beloved Tide did. My husband wasn’t happy. I needed to find something better then my friend had a party/demonstration for Norwex. I had never heard about it-chemical, dye, and other junk-free laundry detergent. If you happen to have a front loading washing machine you only need a half teaspoon per load…if it’s super stinky, gross, or germy I use a pinch more. It really doesn’t have much of a scent but it is CLEAN, like super clean, germ free, and works super well plus you use such a tiny amount it lasts. It is a powder-ish soap so I add a bit of water and put in the liquid dispenser, sometimes to add some “zip” I add a drop of an essential oil, like lavender, and voila-clean laundry! It can smell like anything we want and whites are white, colors stay colored, clothes is soft, and no issues with allergies, fillers, etc. 🙂 Although we always have some mess to clean, or tornado to recover from, our laundry is usually in good shape. Danielle: Thanks, Sarah! You haven’t convinced me to give up my Tide Pods just yet, but the Norwex does sound intriguing. Pam: When my kids reach about 13/14, they do their own laundry. They throw every piece in one load, on cold, wash it all at once, dry it, put it away….well, when they feel like it. But as long as it’s in their room, not my laundry room, I don’t care. I tell them to never wash anything that is new and RED or dark BLUE with their load, or they will end up with pink or light blue everything! So far, so good. When they do get something new, I wash it a couple of times when I am doing laundry. I do my husband’s, the baby, and my other three kids’ laundry. I usually do 4-5 loads, once or twice a week. I spend most of one day washing, drying and folding. I put our stuff and the baby’s stuff away. Anyone older than 4-5 can put their own clean laundry away, and it must be put away when you get it. I don’t like to see clean clothes that I spent all day working on sitting on the floor! I match all socks and if there are some strays (which is rare), I just have the kids put them in their drawer—usually the match shows up in the next week’s laundry. We’re pretty strict about putting all your dirty laundry in the hamper, so we don’t often end up with strays. Danielle: Thanks, Pam! I admire your discipline. I really think that is a key element to making peace with laundry in our lives. a. obviously each kid owns quite a bit of clothing. This would not work with the Little house on the prairie model where each kid owns two pair of jeans, three shirts, and four pair of socks/underwear.We can afford lots of clothing because Thrift Stores. b. Also, because Thrift Stores, there is no problem with throwing red tee shirts in with underwear–the excess dye has already bled out in someone else’s carefully separated laundry system. And we tend to avoid buying any solid white wardrobe pieces because that is just stupid. Similarly, we do not care that white underwear, washed with everything else, quickly acquire a delicate shade of pale grey. c. Children do not own anything that must be washed in a separate “delicate” cycle. Or if they do, it goes, when dirty, into Mom’s hamper, because Mom does wash her clothing on the delicate cycle. 2. Each load goes out of the dryer and back into the kid’s individual hamper. It is conveyed back to their bedroom (whether by kid or mom depends on their age and your rules), and dumped out on their bed so they cannot go to sleep without having put it away. Now,this is big, but it works for us: No one has to fold their clothes unless they want to! Girls dresses and boys dress shirts go on hangers. Everything else may be stuffed in drawers: one drawer for tops, one for bottoms, one for socks and underwear, one for pjs. We never have any trouble finding things, body heat smooths out most wrinkles pretty quickly, and any item that comes out of the dryer badly wrinkled is donated back to the thrift store for the benefit of families who like to fold and iron. This has worked pretty well for years. (Seven kids) Some might call it the Slob method but I call it Casual Laundry. The only time laundry has ever been a hopeless, piled up burden is during stomach virus outbreaks but as you know, that is a separate topic and beyond help by any laundry system. Danielle: I absolutely love your laid-back, practical approach, Daria. See, moms? It can be done differently, and possibly save your sanity in the process! Lisa: Here’s a thing that changed my laundry life! I have the kids bring down the entire hamper(s) to the laundry room. Since MOST if the people in this household drop their dirty laundry in every day, the socks are right there in pairs already so I just clip them together before throwing them into my sorting baskets (darks, etc.). We unclip while folding the dry clothes and throw the clips back in a little basket. I use the kind of clips that look like little feet and actually squeeze and stay together. I tried the kind where you just slide the socks in but they didn’t hold the socks together well enough. I don’t clip wool socks together because I think it puts too much strain on the fabric but I’ve had the same set of clips for many years and I wouldn’t be without them! Elizabeth: I have three hacks and one mind set change. It is so much easier to fold and put away a small load of laundry than a massive heap. I once dated an Italian man who told a story about how he would visit his grandparents, take off his dirty clothes, go to sleep, and his pants would be clean and folded and pressed outside his room by the time he woke up in the morning. That’s a really fast turnaround probably unachievable by me (and forget pressing), but I strive towards having the laundry in the basket for as short a time as possible. If there are just a few items of laundry ready to be washed when I am ready to do laundry, I wash it right away on a smaller cycle. I don’t try to be efficient. I also set a timer so the laundry doesn’t drag out to be an all day task. I strive to have all the laundry for the day done by 12 (I can keep on top of all my laundry, including weekly sheet changes and towels if I do 3 loads a day, but I only have 4 kids, so others might need more loads)— maybe not folded all the way (because my husband helps with that when he comes home), but all the way washed, as much folded and put away as I can. I put one in first thing in the morning, one before homeschool, one again before lunch. Then fold in the afternoon or evening with my husband. 2. Don’t have more clothes than can fit in all your drawers. Ask yourself, If all the clothes were clean, could I put them all away? 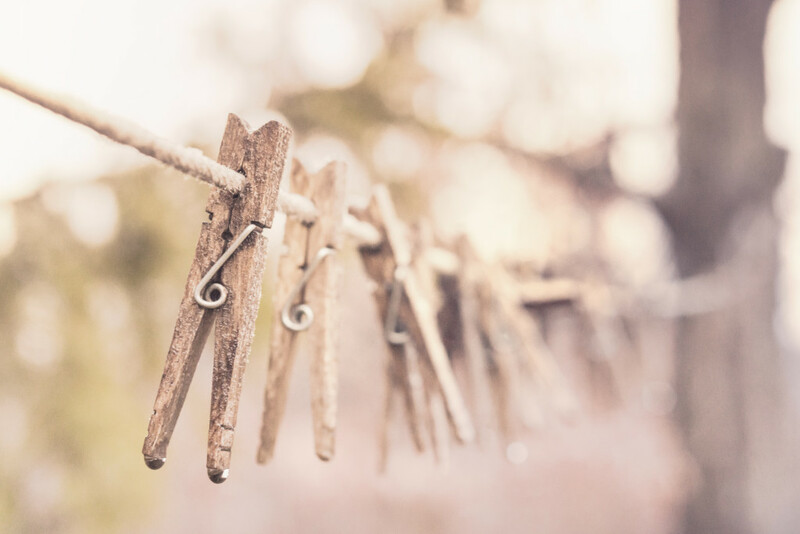 If not PURGE PURGE PURGE your clothes — this is the most important laundry hack, IMO. It transformed my relationship to clothes to clean out my closets. I love taking care of them now that there is a place to put everything and every one’s wardrobe is organized. I make sure every item can go in an outfit (the kids might not wear the exact outfits I imagine, but it’s theoretically possible and there are no orphan items floating around). Every 3 months (not twice a year, that’s not enough) I organize and purge all the drawers in the house (except my husbands’, he is great at taking care of his own clothes). If there’s a pair of pants or shirt that is folded in the back of one of the kids drawers that has never been worn in that three month time, I donate it or save it for the next kid down the line. I go through our stored clothes to see if anyone can fit into something new, I make sure we are actually wearing all the clothes that live in our drawers. If clothes aren’t getting worn at least once a week (with the exception of very special occasion stuff), it is gone. If people give a lot of clothes to you be RUTHLESS about sending them on to good will (I almost never keep anything my mom or in-laws give me, but I say thank you and am grateful, my rule is “would I buy this myself if I saw it in a store?). If something has a stain or an irreparable tear, throw it out. Because the thing that most stalls the laundry process is not having a place to put everything away. And if you have fewer clothes, it takes less time to wash them. 3. Wash everything the same. If it can’t stand warm wash and hot dry, I don’t buy it (again, except special occasion clothes or things like jackets where I will take them to the dry cleaner once or twice a year). The one exception is white towels which I was hot with bleach, but we have enough white towels I can save up for a load once a week. All these things amount to THE LAUNDRY IS NOT THE BOSS OF YOU. Take control of your clothing situation, be rational about it, don’t be a slave to other people’s donations or your own impulse buys, or the size of your laundry basket. I am far from perfect in implementing these things, but when I do, everything is smoother. Danielle: Wow, Elizabeth! Such great tips you share and I love the mindset change. SO many times, it’s tempting to feel victimized by the laundry. Let’s show that beast who’s boss! And thank you, thank you for affirming my pod addiction. Nellie: Back when mine were little, I had two that wore the same size because they were 17 months 17 days apart. One would complain about having no underwear because the other would take all. I used baskets at that time. Someone suggested Underwear Bags! I bought each a mesh laundry bag–large size to hang in their room either by hook or off the doorknob. In went underwear and socks. Cinch tight and throw in wash. I did learn it takes longer to dry (6 bags). But it works. It’s up to them if they want to match socks. I also had a basket for each for clean clothes. The baskets have the clean clothes for them to take to their room. Danielle: Cool! I heard of lingerie laundry bags, but I never heard of this unique use. Very smart, thanks for sharing! Thank you to everyone who shared their tips with me this week. I hope others will benefit from seeing them here. We are not alone. If you have more thoughts or comments, please share them in the comments. Let’s continue to support and encourage one another! I sent an email about my laundry approach. I’m not sure if you got it or not. I guess since I only have one child and less laundry than the average mom, my system isn’t going to be very helpful for large families. I’m so sorry for that oversight, Claire! It was not at all intentional. I went back through my email, found your note there, and added it above. Thank you so much for sharing!